Bổ sung cho bộ đề thi thử Tiếng Anh năm 2017, Thích Tiếng Anh chia sẻ “Đề thi thử Tiếng Anh trường THPT Hải Lăng năm 2017“. 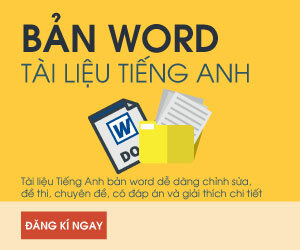 có đáp án cho các bạn và bản WORD cho thầy cô hay các bạn chỉnh sửa. Question 5: By the time I went to bed last night, I _________ my homework. Question 5: Handball is fast becoming _____ popular sport worldwide. Question 7: This shirt is ______ that one. Question 8: I suggest _____ different kinds of waste in different places. Question 9: The gangsters avoided arrest for several weeks because they _________ the state. Question 10: When both parents went to prison, social workers took the children _______ care. Question 11: Fortunately, the plane landed ______ after the violent storm. Question 12: During his ______, his family lived in the United States. Question 13: I can’t ______my mind which shirt I should take. Question 14: Small children who have special needs can _________ this new application. Question 15: ____ the lion did not try to hurt him, Androcles went nearer to pull out the thorn. Question 16: There’s a law that says you ________ throw trash on the street. Question 17: Developing new technologies are time-consuming and expensive. them intellectual stimulation should be the aim of high school. Question 19: It is difficult to get used to sleep in a tent after having a soft, comfortable bed to lie on. Question 20: John was in Hanoi and wanted to send a parcel to his parents. He asked a local passer-by the way to the post-office. Question 23: People are busy buying gifts, cleaning and decorating the house and cooking traditional foods to welcome Tet holiday now. MarktheletterA, B, C,or D on your answer sheet to indicate the word(s)OPPOSITEin meaning to the underlined word(s) in each of the following questions. Question 24: Since it is to be a surprise, don’t let the cat out of the bag. Question 25: A deficiency of vitamin D can lead to permanent bone deformities. Question 26: I wish my English were fluent enough to go for the interview. My English is too fluent to go for the interview. My English is fluent enough to go for the interview. If only my English were fluent enough for me to go for the interview. My English were fluent enough and I could go for the interview. Question 27: Mary felt quite certain that her sister would stand by her, but in the end she didn’t. Mary didn’t expect her own sister to let her down like that. It came as a terrible shock to Mary when her own sister turned against her like that. Mary had hoped that her sister would come to her aid, but she never did. Mary was confident that she would have her sister’s support, but as it turned out she let her down. Question 28: “Don’t come home late, Jenny, it is dangerous!” her father said. Jenny’s father advised her to come home early. Jenny’s father told her not to come home late because it was dangerous. Jenny’s father asked her against being home late because it may be dangerous. Jenny’s father told her not to come home late and it was dangerous. Question 29: Some economists argue that new technology cause unemployment. Others feel that it allows more jobs to be created. Arguing that new technology causes unemployment, other economists; feel that it allows more jobs to be created. Some economists argue that new technology causes unemployment whereas others feel that it allows more jobs to be created. Besides the argument that new technology causes unemployment, some economists feel that it allows more jobs to be created. Some economists argue that new technology causes unemployment, so others feel that it allows more jobs to be created. Question 30: Their dog was fierce. Nobody would visit them. So fierce a dog did they had that nobody would visit them. So fierce was their dog that nobody would visit them. Their dog was fierce enough for anybody to visit them. If their dog weren’t fierce, somebody would visit them. Lifelong learning is now becoming a (31) ___ for everyone in the modern world. Many people, however, find it overwhelming, as being lifelong learners they will have to keep studying for their entire life. The following are several strategies to promote lifelong learning. First, start with a clear purpose. Study something (32) ___ you will likely have many uses for in the future. Design learning goals that should serve you in your career path, as well as in your personal interests. You will need to think of the learning experience as continuous investment (33) ___ than a one-off endeavor. Second, choose to study something that is really enjoyable for you. You will need to have fun all through the (34) ___ of knowledge and skills, which will be an endless journey. The ‘fun’ part will always keep you motivated, even during the hard times. Third, you will need to accept that nowadays education is not simply the preparation for life. New times mean new ways: life is education itself. With this mindset, you will embrace challenges as opportunities (35) ___ growth. Với “Đề thi thử Tiếng Anh trường THPT Hải Lăng năm 2017” mà Thích Tiếng Anh chia sẻ, chúc các bạn làm đề thu hoạch được nhiều kiến thức hay nhé!